Republican presidential candidate Donald Trump speaks at a campaign rally in Akron, Ohio, Aug. 22, 2016. Republican presidential candidate Donald Trump is demanding that an independent special prosecutor immediately investigate Hillary and Bill Clinton's Clinton Foundation, saying the FBI cannot be trusted to do the job. Trump spent much of a Monday campaign speech in Akron, Ohio, on what he describes as the "vast scope" of Hillary Clinton's "criminality," saying he is shocked by it. Clinton's Republican opponents allege that big donors to the charitable foundation used it to get special access to Clinton or her top aides when she was secretary of state. Clinton has always denied the charge. Newly released emails show that while some Clinton aides were asked for favors, there is no evidence that they were granted or that Clinton herself was involved. 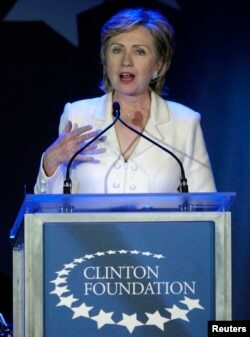 FILE - Then-Senator Hillary Clinton, wife of former U.S. President Bill Clinton, speaks at a fundraising gala for the Clinton Foundation in New York, Oct. 28, 2006. Bill Clinton announced last week that the foundation will change the way it does business if his wife is elected. It will stop accepting foreign and corporate donations and Bill Clinton himself will resign from its board, he said. None of this has satisfied Trump. He demanded Monday that the foundation be shut down, calling it “the most corrupt enterprise in political history," and accusing the Clintons themselves of caring more about donors and their own bank accounts than the American people. But the Clinton campaign shot back at the billionaire real estate and industrial magnate. "The Clinton Foundation is a charity that helps people around the world," spokesman Brian Fallon tweeted Monday. "Trump's businesses exist to enrich himself, involve a web of shady connections, and he still hasn't committed to divesting his holdings." Also in Akron, Trump declared the "era of economic surrender is over," vowing to pull out of the Trans-Pacific Partnership trade deal and renegotiate NAFTA. He said bad trade deals have cost Akron, an industrial Midwestern city, thousands of jobs. Trump warned that companies are currently negotiating to leave Ohio, and said he will stop them. He gave no details. The latest polls in Ohio give Clinton a 6 percentage point lead over Trump, and a nearly 6-point lead nationwide. But Trump, who is not known for his modesty, said he is going to win by a landslide. Meanwhile, a former U.S. president says the American people do not like either candidate in the November election. Jimmy Carter told the Associated Press "the way it's turned out, both choices in the major parties are quite unpopular, but I don't have any doubt that one of the candidates is better qualified than the other." Carter did not say how he personally feels about each candidate, but he did say "everybody knows that I'm a Democrat and I'll be voting Democratic." VOA’s William Gallo contributed to this report.